Writing this perimeter security blog is a great exercise for us here at Advanced Perimeter Systems. Not only do we get to share some of the more interesting and fun aspects of the world of perimeter security but it sometimes makes us think more deeply about what we do, why and its evolution. Take the subject of electric fence security for example. 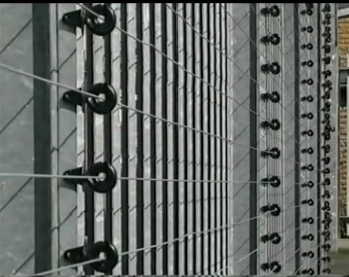 Our Electro-Fence™ has been a favoured fence security and protection product for many years. Installed at many sites in many countries, it has proven itself time and again as a great intruder deterrent. From prison security to the protection of nuclear power plants and more. We recently wrote about nuclear power plant security (click here to read the full article) and just yesterday we realized that we did not mention one of the projects we had been involved in. That was the Springfields nuclear fuel production site in Lancashire, England. So why mention that today? Well, the reason is not so much in how we provided perimeter security for the site but the amazing connections that sprang to mind ... a bit like pieces of a jigsaw coming together to make an interesting picture! Springfields was the first nuclear plant in the world to ever produce fuel for a commercial power station producing electricity for a national grid. Westinghouse Electric takes its name from George Westinghouse. He laid claim to another 'world first' - the development of the alternating electrical current system. In collaboration with the genius Nikola Tesla he changed the world for ever and his electrical company grew to become one of the biggest of its kind in history with many subsidiary electrical companies being founded in other countries as a result. The product we supplied to protect the perimeter fence at the Springfields site is an electric fence system.